I’ve heard people say that Havant & Waterlooville could not sustain a side in the Conference National division, due to fairly low attendances, and if we’re honest, the Pompey fixation of the people of Leigh Park (a Portsmouth City Council administered housing estate slap bang in the middle of the Havant Borough). This is probably a fairly accurate assessment, but that doesn’t stop the like of Farnborough and Leigh RMI competing and surviving. Just. 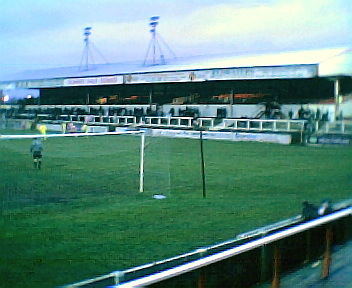 The people of Leigh appear even less interested in their side, the regular home support can be estimated at about 200, even on a Saturday. This is perhaps not surprising considering the Rail Mechanics Institute used to be in Horwich, but with a ground in a state that would deny any further pyramid progression. Their move to Leigh was only ten years ago and whatever your past, a new ‘history’ and ‘community’ has to be created, as we have found at H&W, and this takes a while. Perhaps no wonder then, particularly as Leigh are in the Rugby League belt, and share their home with Leigh Centurions RLFC, not to mention a few seasons of struggle, that crowds are hard to come by. 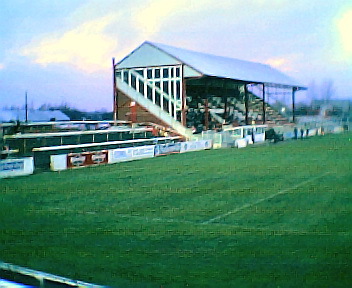 In fairness, the move was a great initial success as the new Leigh RMI were now equipped to ascend the pyramid and did just that, rocketing up from the first division of the Northern League into the Conference within a few years and have clung on in the top non-league tier for longer than might have been expected of a team with crowds that never show any sign of growth aside from when the ‘big’ clubs visit. However, reality would appear in the process of biting as it looks like Leigh are doomed to relegation this year. Indeed, some might argue that they might consider themselves lucky to be in the Conference in the first place considering their reprieve last season. 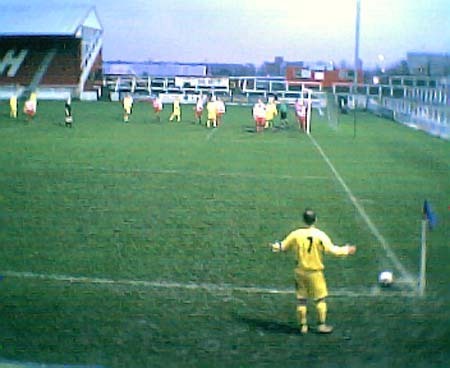 Having finished in the bottom three in 2003/04, Leigh along with the other two sides stayed up by virtue of Telford’s liquidation, Margate’s demotion due to ground sharing problems, and Northern League champions Hucknall not being in a position, ground-wise, to take promotion. As it stands now, they are bottom, 9 points behind Northwich whose points tally INCLUDES a ten point deduction for entering administration. It is likely therefore that todays FA Trophy opponents Altrincham will face them again next season, twice, as part of the Conference North programme. Indeed despite their differing status, Altrincham were always seen as favourites for this game, but it was fairly even until the first goal popped in after 75 minutes. 10 minutes later, a hash of a kick from the keeper out wide of his area, allowed Colin Little to curve it in from 30 yards, albeit very slowly and only just out of reach of the keeper’s despairing lunge. Leigh then upped the pace, scored in the final minute and inordinate amount’s of injury time almost brought about an equaliser, but sadly for the Leigh faithful (and god bless those happy few) it was not to come. The legions of extremely vocal Altrincham supporters, including their London branch (represented by 2 flags for, probably, one person) however were delighted. It was all tickertape and loadsa songs from their boys, fair play for that, but no need to sing songs about Leigh’s league and financial predicament, in my humble. No need to kick a set of supporters, however small, when they’re down. Why not some pro-Alty tunage in the final ten and coasting, as there had been in the first half when the game was still in the balance. Ah well. Maybe it takes a bunch of Watford drunks to consider following Leigh RMI a sound proposition. They might well leap on the Virgin to Wigan from Watford, then bus it to Leigh every other Saturday for a healthy dose of heavy defeat. Perhaps the church offers this as a way to repent for all your dirty drunken sins. Standing on the crumbling terraces in the rain, I wonder if I wouldn’t rather be turned into a pillar of salt.